Milk bars are egalitarian diners where you can eat a portion of pierogi in thirty minutes or less, and they are popular with every social category. Milk bars are often considered a communist legacy, but in fact their existence predates the communist era. Pierogi please! Such a yell announces milk bar patrons that their food is ready. In such places you order at a register and then wait at a table for your food to be prepared. Once your order is ready, it is placed on a counter separating the kitchen from the dining room. It is then announced loud and clear from behind the counter which dish is currently waiting to be collected. There are no waiters in milk bars. You bring your food to your table by yourself. So if you’re sitting by a table waiting for the cucumber soup you just ordered, you’ll want to get up to get your food from the counter once you hear the words “cucumber soup please!” spoken by somebody in the kitchen. As for the cutlery and napkins, you’ll need to get them from special containers. Don’t expect to have the table all to yourself. You might, but there’s no telling. It also customary to sit with strangers if there are no free tables left. 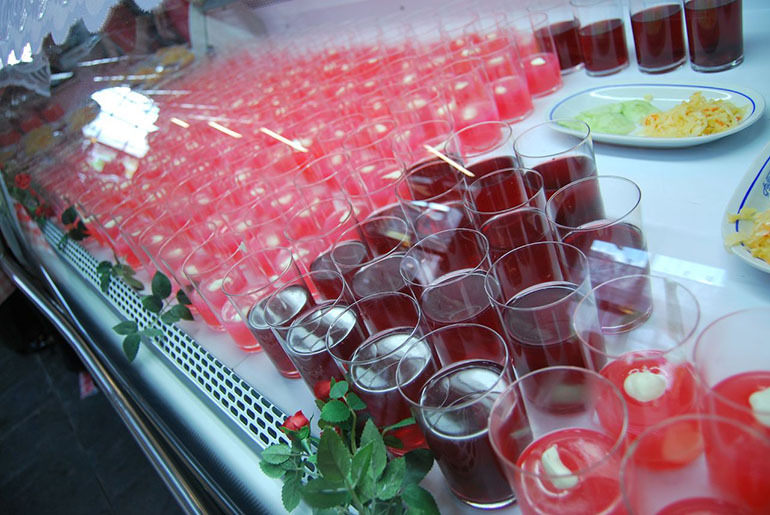 In milk bars you can order chiefly traditional and ordinary Polish food like pierogi, tomato soup or cutlets. As the term milk bar suggests, dishes based on milk and dairy products play a special role in these menus. Pancakes with white cheese, leniwki (dumplings made from cheese, flour and eggs), milk soup and rice with fruit and cream are among the most popular dishes. The reassuring home cooking prepared by these establishments is one of the reasons for their lasting popularity. Milk bars are also appreciated because they’re fast, cheap, unpretentious and serve fresh food without artificial additives. Several milk bars in Poland are still subsidised by the state. Most of them offer several menu items for less than a pound/dollar. You can often bump into people, such as college students or retirees, who need to manage their money carefully. People whose financial situation is even more complicated also show up at milk bars. Such places sometimes have agreements with Social Security in order to provide the homeless and unemployed with food. However, milk bars are equally popular with yuppies and white-collar crowds, who are short on time rather than money. That’s why during lunch break hours milk bars fill up with people in formal office wear. At a milk bar close to one’s workplace one can easily eat a substantial meal during a half-hour long break. Some come to milk bars for the atmosphere. Their laidback ambience is also popular with hipsters. Celebrities and politician sometimes come to milk bars as well. Popular Polish pop singer Doda occasionally dines at the milk bar Bambino Bar in Warsaw and Robert Biedroń, Mayor of Słupsk, admits that he’s a regular client of the local milk bar Poranek. Some wrongly consider milk bars to be a communist idea. In fact the first milk bar was founded long before Poland ended up on the wrong side of the Iron Curtain. The said establishment was called Mleczarnia Nadświdrzańska and was opened in Warsaw in 1896 by the Polish landowner and dairy farmer Stanisław Dłużewski. 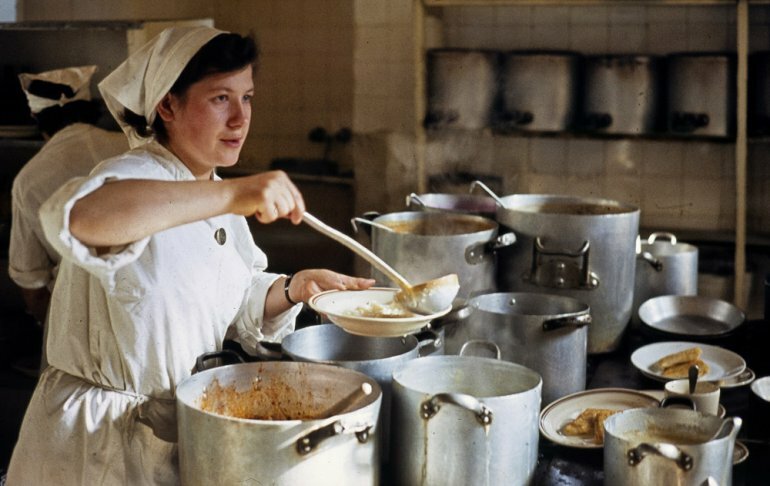 This milk bar served cheap dishes made from milk, dairy products, eggs and flour. There was no meat on Mleczarnia Nadświdrzańska’s menu. The establishment became an instant hit, and similar places started to appear all over partitioned Poland. After World War I the popularity of milk bars, which offered affordably priced food, rose due to the austerity of the post-war economic conditions in reborn Poland. After World War II if you wanted to eat out in Poland you often had no other choice but to go to a milk bar – under the communist regime normal restaurants were a rarity, but there were plenty of milk bars. One ought to remember however that in the economical system of communist Poland, customer satisfaction wasn’t a priority, to put things mildly, and this led to the bad reputations of milk bars in communist Poland. This perception is best understood by watching one of the scenes from the famous 1980 Polish comedy movie Miś / Teddy Bear. 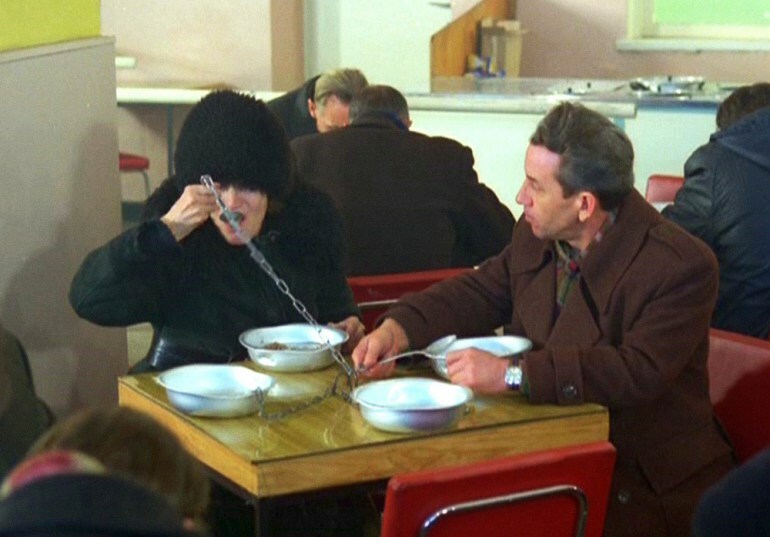 This scene shows a parody of a milk bar where people eat from metal plates screwed onto tables, using spoons that are attached to preposterous anti-theft chains. Fortunately milk bars in today’s Poland have nothing to do with this grotesque vision from the past. They are nice, customer-oriented places that offer good, fresh food at low prices in a typically Polish atmosphere. If you want a taste of Poland, you know where to go.